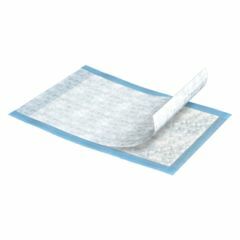 AllegroMedical.com presents The Harmonie Disposable Underpads - Ultra Absorbency. The Harmonie Disposable Underpads can be used to protect any surface such as beds, chairs, floors, and car seats. Harmonie Disposable Underpads feature a soft, vented interior liner that is non-irritating to skin. The bed pads provide a soft, resistant outer layer for maximum patient comfort. Each underpad also has a quilted mat for the incontinence pads to enhance fluid dispersion evenly and avoid build-up. The Ultra Plus disposable underpads also feature super absorbent microbeads to provide the utmost protection and keep moisture away from the skin. Harmonie underpads are latex free. From the makers of TENA products (SCA Incontinence Care). As I had said, wished these were more absorbent. Maybe thicker? Best pad....very soft and absorbent. Will buy again if needed. They come in handy with bathroom or other types of emergencies that require after use disposal. Hopes with an adult who is bedridden, protects the sheets. My dog is incontinent and these pads are super absorbent on both the front and the back. They have made my life easier cleaning up after my dog. I recommend these highly and will repurchase shortly.